Living… in her hometown of Shelby, North Carolina. 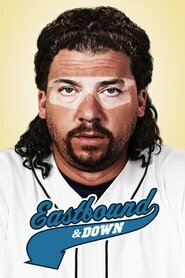 It was a nice, peaceful life until Shelby’s greatest son – and her high school sweetheart, Kenny Powers – returned to town following his much-publicized fall from grace. Profession… art teacher. She becomes co-workers with Kenny after he flames out in the majors and joins her school’s staff as a gym teacher. He immediately wreaks havoc on the school grounds, the faculty and the student body, but he does the most damage to her personal life. Relationship Status... engaged to her school’s principal, Terrence Cutler. But she has a history with Kenny, and there’s something alluring about his outrageous attitude. When it looks like Kenny might have a shot at a Major League comeback, she has a tough decision to make: the safety and security of a life with the boring Terrence, or a risky ride to fame and fortune with Kenny. Challenge… protecting her life from being completely destroyed by Kenny’s recklessness. April expects affection and tenderness in their relationship – things that are well beyond his capabilities as a potential boyfriend. She wants to change him, but he continues to be unfailingly dishonest and ungrateful to her. Personality… strong, compassionate, forgiving, and loyal. April sees through Kenny’s bravado and is one of the few people who can keep his ego in check. With the promise of a quiet suburban life with Terrance in her back pocket, she knows Kenny needs her more than she needs him. April Buchanon's popularity ranking on CharacTour is #5011 out of 5,000+ characters. See our top-ranked characters and read their profiles.